We are very honoured and thrilled to announce that Mark Allison the remarkable Geordie athlete who ran 3,100 miles from California to New York recently and raised over £100,000 for charity yesterday joined Tyne Bridge Harriers. Our club vest is almost ready to be manufactured for delivery in February . Thanks for all the feedback regarding the club badge too. Weekly track sessions will commence at Churchill Track starting this Saturday (22nd) at 11:00. Run Northumberland Half Marathon, is a new race. 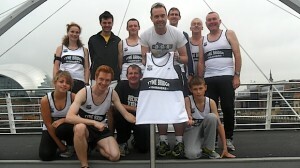 It would be a good one for anyone building up for a spring marathon, and might be a first outing for our new vests.